Do you remember the shopping bag some posts ago? It was the second one I have made using recycled fabrics. The first one was with a special pocket. I always lost my "have to buy" list and was angry finding I forget to buy something I need. Of course I go the shop again. This idea inspired me suddenly by night. What will be happen if I have by hand my list. Yes, this would be great. A special pocket for the list. Think a little bit what is the perfect size of a bag. Sew the pocket first and then follow the tutorial from before. The finished "windows"pocket is 4"x 8". Sew together some scraps to have 4,5" x 8,5" rectangle. You could make oval schape, too. It is up to you. Cut the same rectangle from lining. Right side together sew ONLY along inner edge. Clip the corners and curved seam allowance half inch apart to stay flat after turning over. Fold the edges and stitch only the upper one. Place a piece of elastic cord for fastening and pin. Place on the front part of the bag and stitch. Now you can put your Have to buy list and go shopping. From today till 13 of February all patterns in my Etsy shop are on SALE. Next two weeks you have chance to save money! Two years earlier I found seminole quilt borders and was amazed how easy it happens. A boarder that seems very complicated is easy to sew following some simple steps. 1. Cut 3 strips and sew them together. 2. Cut equal pieces along the strips. 3. Turn each even piece. 4. Sew together and trim. Sew them together to have such long strip. Cut 1,5 " pieces along the whole strip, turn and stitch. Don't worry you have to trim. In my case I want to sew table napkins, so add a 2" strip on the left and 11,5" square on the right. Right side together sew with the backing fabric leaving 4" opening for turning over. After turning over iron well. Stitch along the boarder and the edges. You are ready for serving! 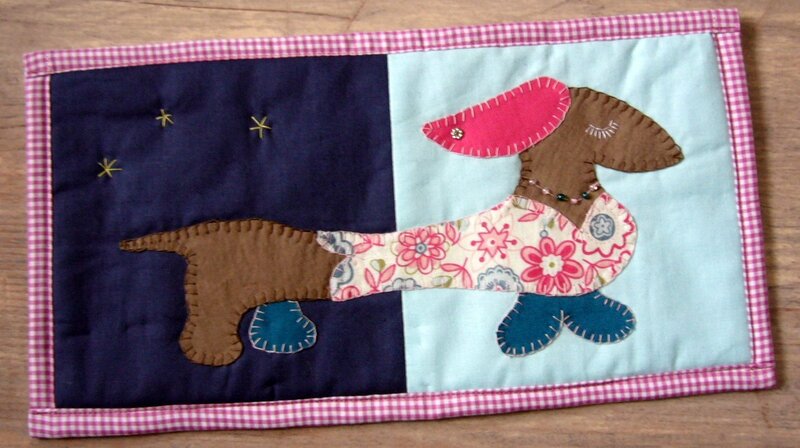 What a fun is sewing mug rugs! I have designed some till now. But weenie dog is one of my favorite. A yong Gentleman was born at the beginning. I promised to create a lady for him. Shiny and well dressed. With necklace and ear ring waiting for her beloved. You can buy the pattern from my shops CRAFTSY or ETSY. The dogs are a nice couple I think. Make as a gift for a family. Oh, am I said family? What an idea came into my head. Wait some days and come back. Sometimes when have no time to create a whole quilt and need to keep me sane and doing something by hands I recycling. Open an old suitcase full with shirts, denim and scraps. Pick up the smallest pieces and began sewing. This time it was strips inspired by Nova from acuppaandacatchup. Sewn, cut, changed, sewn again! Everybody has a pair of old jeans. Or more, probably. A friend of mine asked me to sew a shopping bag from her son's old jeans. The only desire is to keep the back pocket. It is nice with the red stitch lines. Oh, you want to see the bag, do you? Here it is. 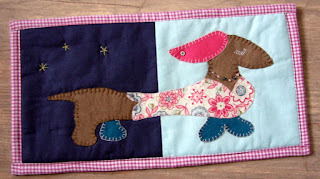 I have took some pictures during the sewing so now I am writing a tutorial. First of all cut the seam of the inner side of the jeans. Fold in half and cut the back part for the bag. Note that the side seam is not in the middle. The front and back parts of the trouser's leg are not equal. The front part is collected from different pieces including back pocket. You can cut them where decide from. Or follow my way. These jeans were not so big and I have to be careful with cutting . From other trouser's leg cut the pieces. Sew right side together half inch seam allowances. First sew upper row. Press seam allowances open and stitch zig-zag with a thread different color. I have seen this method on Victoria Gertenbach's site. I love it and used different threads for the different seams. Cut from the rests 2 pieces for the handles and add this way. To be completely green I recycled an used shirt for the lining. Put a piece of the shirt under the bag's part and cut. Sew the handles along - first the side seam then the middle. Make some back stitches at the end of the handle and leave open for turning over. I used a gray threat so it is not visible - I have pointing with the pencil. Turn over and iron well. Repeat the same with the other part. Then order them right side together and stitch only along the side. 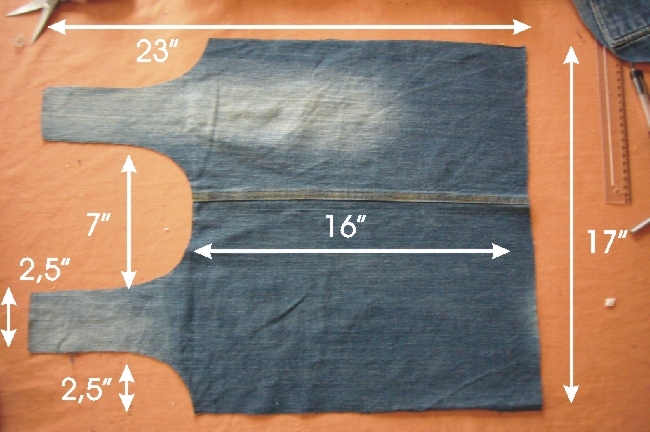 Open the seam allowances and zig-zag only the denim fabric. Turn the side seam 2" towards the middle and stitch the bottom. I recommend to stitch twice for more strength and security. Now it is time to connect the handles. 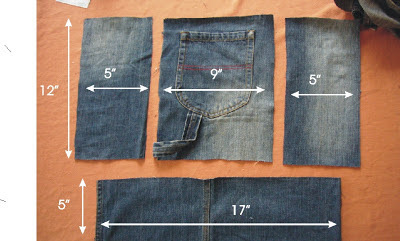 Place two parts of the handles and stitch the denim only. Insert one part of the lining under another, pin and stitch. It is possible to sew by hand. Repeat the same with the other handle. I have added a button and piece of elastic for fastening when fold the bag. Add a button under the bottom of the pocket. How to fold? It is easy. Place on a flat surface, fold, roll up and fasten with the button. I have ordered pieces three different ways on my table. And began sewing them by columns. When finished (2 hours later) noticed I have collected them by absolutely new way. I have changed the place of two of the columns. Oh my God! I refused ripping - the quilt looks great. The origin idea of Dan Rouse will be implemented next time.With bigger pieces and bigger size. Mine is small enough to add more pieces for better look. The illusion will be entire on a larger surface. I think I will finish as a wall hanging. I have to put somewhere round me a design wall. 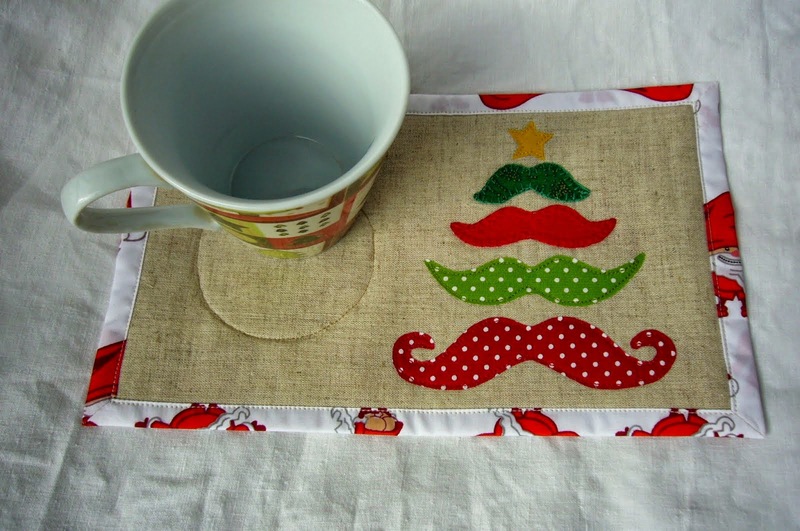 I have an idea about this mug rug a month ago but it was busy time before Christmas. It is easy to sew, nothing special. First I have thought the shape - it has to be as a house. And then I began drawing and writing the letters. If the heart is at home let it be at home. I have changed the letter "O" with a heart! Added a small attic window with flowers. If you think it is to complicated to make alone visit my shop HERE for the pattern. I wish you many creative days!